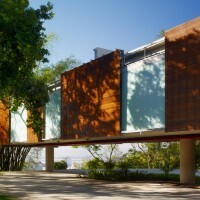 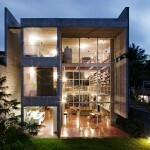 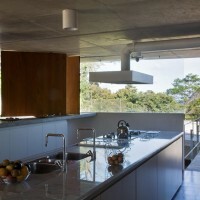 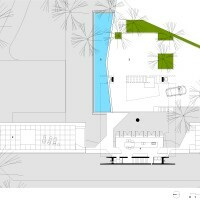 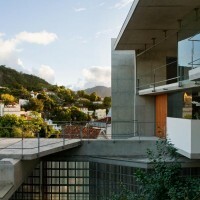 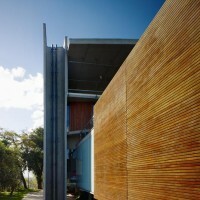 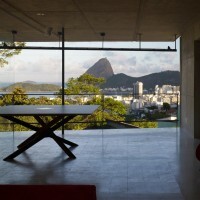 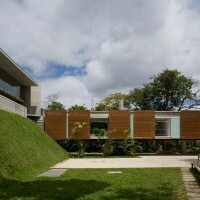 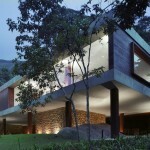 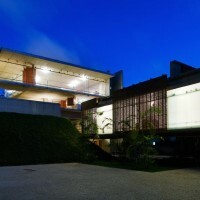 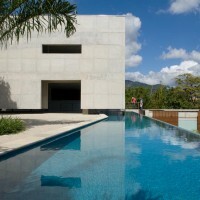 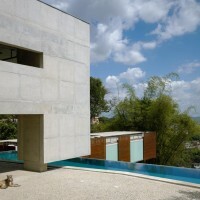 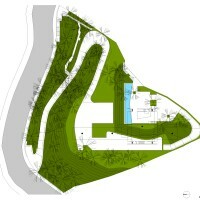 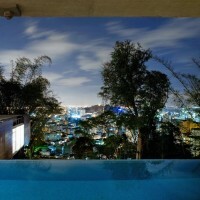 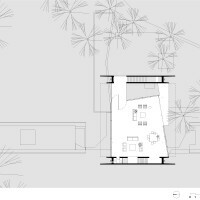 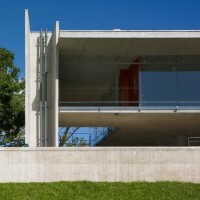 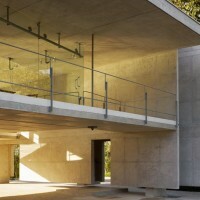 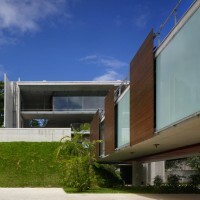 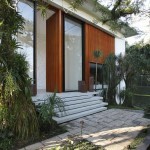 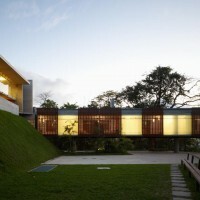 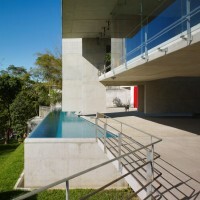 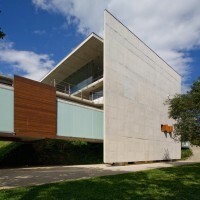 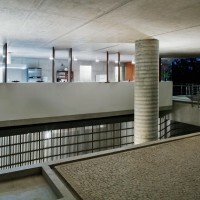 SPBR Architects designed the House in Santa Teresa in Rio de Janeiro, Brazil. 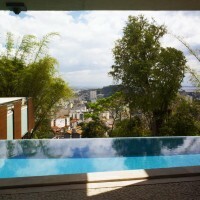 Santa Teresa is a historical neighborhood that offers some great views of the city of Rio de Janeiro. 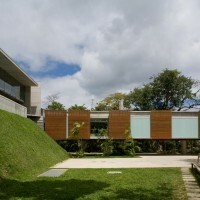 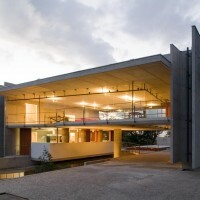 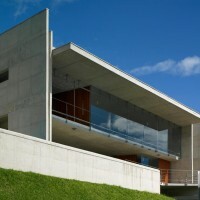 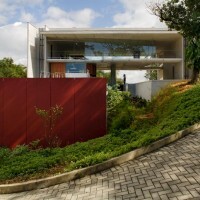 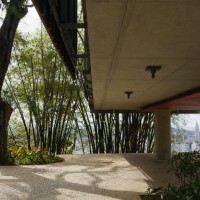 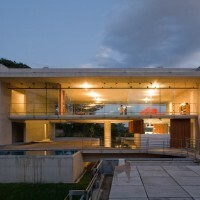 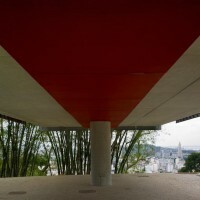 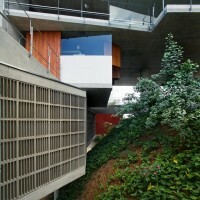 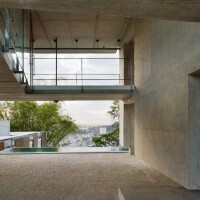 The house is located in one of the highest points of Santa Teresa’s hill. 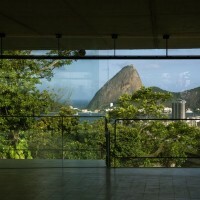 From the north side of the house it is possible to see the old downtown; from the south side, a more panoramic view of Pão de Açucar and the Guanabara Bay. 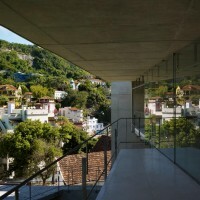 The site starts at 100 m above sea level at the cable car street and finishes at 125m at a breathtaking viewpoint of Pão de Açucar. 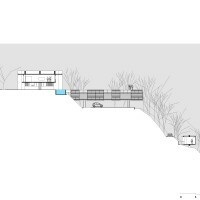 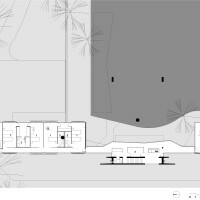 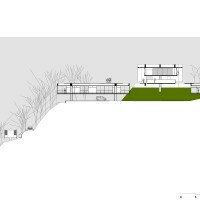 The project takes into consideration the two pre-existent levels of the pronounced topography: 120 m and 125 m over sea level. 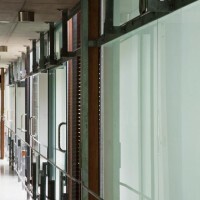 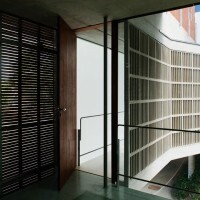 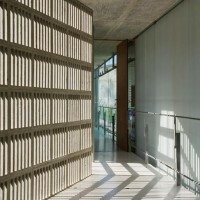 At the lower level, there is a linear block that leads to the bedrooms and the office. 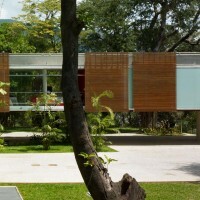 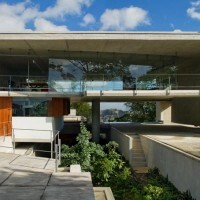 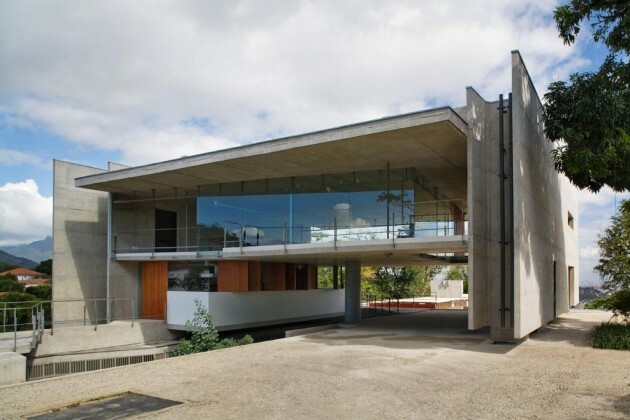 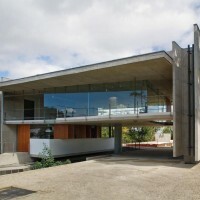 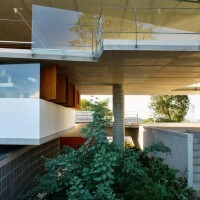 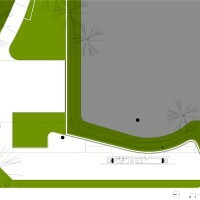 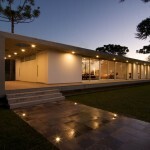 Their main glass facade opens up to the enjoying garden on the east side. 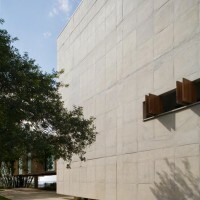 These two prismatic and linear volumes are opened on the east and west sides but are completely closed on the north and south sides, living the ground under them empty. 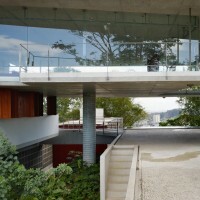 The roof was designed to make a complementary ground on the upper plateau. 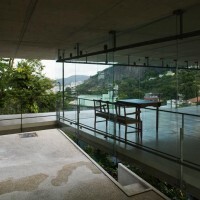 The living room is located over the higher plateau providing a view of downtown on the north side and of the Guanabara Bay and Pão de Açucar on the south. 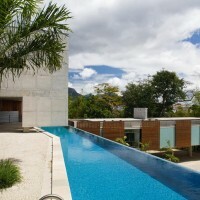 This volume is closed on the east and west sides to avoid sun heat and to emphasize the magnificent views on the other sides. 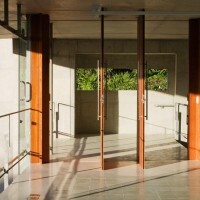 It leaves the level below completely open. 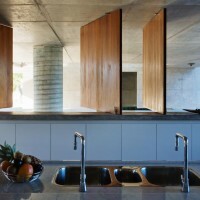 Thus, there is a bare level between bedrooms and living room which is filled by the kitchen, where, according to the traditional Brazilian culture, most people will spend their spare time. 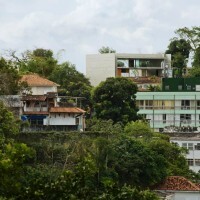 It is a spread out and blown-up construction that should become part of Rio de Janeiro’s landscape. 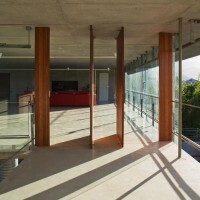 Visit the SPBR Architects website – here.